A whole wing of the Internet just got added to our collective conscience, like websites by Google or knowledge by Wikipedia before it. Yet the news cruised by with analysis focused simply on what Facebook’s new keyword post search does today. Yes, any post by you or any of your friends can now be dug up with a quick search from mobile. But I don’t think people realize how big a deal it is for tomorrow. Facebook just went from data rich to Scrooge-McDuck-swimming-in-a-tower-full-of data rich. The ramifications for advertising, developers, and Facebook itself are tough to fathom. Our most vivid doppelgänger, our digital echoes can now be tracked. They don’t just say who we were, but where we’re headed, and what we’ll want next. First, the trillion post index gives us group memory. Each person can only search stories from their friends and surrounding network, but Mark Zuckerberg recently said those all add up to over 1 trillion posts. If your friends put their lives on Facebook, you can now remember them too. You could say these are just faded snapshots, nowhere near the real thing, but how much of our own lives do we forget completely? Search yourself and almost any word, and you’ll likely discover scenes from your own past that you didn’t find worth saving locally. If we know existence is too rich for us to record everything in our minds, and accept that Facebook posts are merely hints or triggers of long-gone moments, we can augment our memories without the guilt that we’re replacing them. But this is not the Facebook Timeline. Since 2011, we’ve been able to dive into one friend’s grand narrative. But minus the creepiest of us, few aimlessly dig so deep. Post search weaves different lives together by the virtue of the words chosen to describe them. What does “fun” or “love” or “worried” conjure from different perspectives within our network? This is a question we can suddenly answer. Second, you could say Facebook knew a lot about us before, but didn’t understand it until now, like a student with the facts memorized who finally learned how they piece together into history. Facebook’s product depends on guessing what we want based on who we were. Before, that meant who we said we were, which friends we communicated with, what we liked, and where we browsed. Now, to Facebook, we’re also what we said, and that says a lot. Most obviously, the News Feed could learn to mimic our external dialogue, showing us posts with similar content to what we spread. Never talk about sports or babies? Facebook could eventually filter those out of your feed. Just shared your thoughts on Syria, celebrity gossip, or the police state? The algorithm could pull an audible and show you more about related news. Suggested Friends. Suggested Events. Suggested Pages to Like. Facebook was previously going on some taps and a top-level view of your identity. Now it has a much more intimate impression of who we are. Developers could eventually get a better understanding of us too. Imagine a Facebook post search API. One that could bring the ability to at least recall your own posts to other apps. It doesn’t exist now, but Facebook is eager to equip developers with personalization tools in hopes they’ll buy or host its ads. With reams of what we’ve written, everything stands to get a lot more relevant. Especially ads. I have to imagine somewhere in a glossy agency boardroom, two ad bros are giddily fist-bumping at the prospect of so much targeting data. 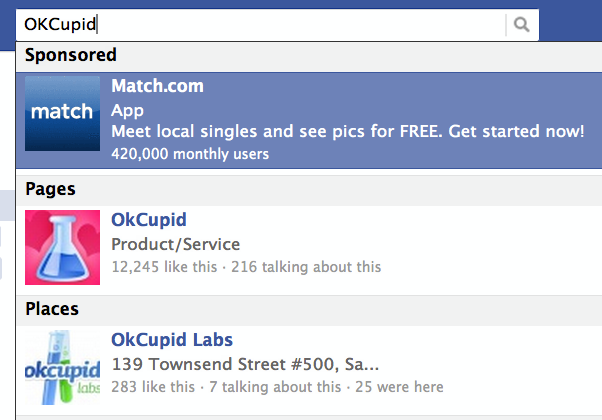 Facebook says there’s no new advertising options coming out of post search, but the key omission is the word “yet”. Facebook’s great weakness in advertising has been that it doesn’t know what you’re thinking right now the way Google Search does. All that profile and interest data make Facebook ace at big brand advertising. But it lacks the urgent purchase intent that lets search engines charge lucrative ad rates to put ads for cameras atop searches for “best camera”. Facebook keyword advertising could change that. Instead of the related ads showing up on search results, they’d appear on your feed right after you post. All those “What movie should I see?”, “Can’t wait to visit Portland tomorrow!”, “My car just died” posts are ripe with purchase intent advertisers would love to exploit leverage. Not just on Facebook, either. The company’s ad targeting tentacles now reach across the web and mobile through its acquisition of video ad middleman LiveRail and the launch of its mobile ad network. Marketing messages powered by Facebook on third-party sites and apps stand to grow smarter too. 20 months ago I suggested Google should worry because its’ stranglehold on purchase intent could weaken if Facebook figured out keyword advertising. Soon the two, and Twitter too, could in fact be battling for “search ad” dollars. At some point while reading this, your skin should have started to crawl just a little bit thinking about the privacy implications of Facebook indexing 1 trillion posts. Privacy by obscurity is basically dead. Previously, if you posted something dumb once upon a time, you were safe unless someone painstakingly browsed back through your Timeline post by post, month by month and dredged it up. Now anyone armed with the right, or wrong keywords can pull up your worst moments, and either quietly judge or publicly shame you. Don’t believe it? Just search some slurs and see which of your friends come up. Job seekers and public figures beware. Now is probably a good time to run some searches on yourself and make amends for anything stupid you said. Technically, your privacy settings haven’t changed, but how privacy functions on Facebook has. Beyond interpersonal relations, some might be uncomfortable with the concept of Facebook knowing so much about them. The trillion post index sure won’t lessen people’s Big Brother paranoia. More than ever, we’re coerced by the value of its service to trust Facebook to be a benevolent steward of our info. Not everyone’s comfortable implicitly signing that contract. Facebook even records what you search for, though the Activity Log is private and can be edited. And if you think ads are already creepy, just wait. Those retargeted ads that follow you around web selling things you checked out earlier are just the beginning. What you said 5 minutes or 5 years ago could soon inform the ads you see, whispering hints at how they can talk like you to seem more attractive. Ads are inevitable. I’d rather they be for things I might actually want. Their revenue pays for free services for everyone, not just those who could afford to pay. Still, it’s a little unnerving how quickly they’re getting smarter. Intelligent, even. Now Facebook has more reason than ever to pour money into its artificial intelligence initiative. AI will let Facebook decipher meaning at scale, mining the trillion posts to improve everything’s relevancy without needing human employees to pry into anyone’s content. Zuckerberg hasn’t been shy about this. He’s repeatedly said that alongside Oculus for virtual reality and Internet.org for information accessibility, AI is one of Facebook’s top three long-term goals. Facebook has spent that last 8 years collecting the posts we wrote. First came displaying them in the News Feed, then making them browsable through Timeline, and now finally there’s search. What comes next will be harder to see, but it’ll make it clear that Facebook’s been sitting on a gold mine. Because it’s not about how big your data is. It’s what you do with it.